The following moving checklist is being reprinted with the permission of Apartment Guide.com, and could prove helpful. If your moving timetable is shorter than the one in this checklist, don’t panic! Just use this list as a guideline to keep you on track and adjust the weeks to match your timeline. • Set up a moving file or notebook to keep all of your moving information in one place. • Make a moving decision. Will you hire a moving company or move yourself? • If you are hiring a moving service, research and hire a moving company. 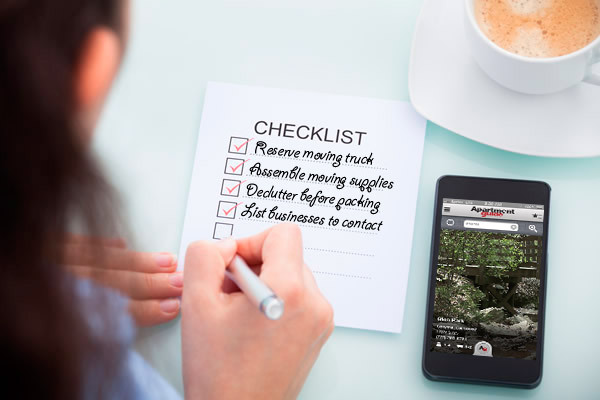 • If you are making a long-distance move, check to see if there are any special considerations you need to make, such as arranging for auto shipping. • Calculate the costs of your move and set up a moving budget. • Do some research on the area you will be moving to and research local schools and community resources. • Check your current apartment lease to see how much notice you need to give to move out. • Find out if your move is tax deductible. • Finalize move-in details with your new apartment. Ask if there are any move-in regulations or special parking arrangements you have to make for moving day. • Find new care providers for you and your family (doctors, child care, etc.). Transfer any school or medical records. • Contact your insurance company to arrange for renter’s insurance at your new apartment and set a date to cancel your current policy after you move out. • Make a list of who to notify about your move and when. This list should include friends, creditors, doctors, schools, your current and former employers, and any church or professional organizations to which you belong. • Start gathering moving supplies and moving boxes. • Start thinking about how you will arrange your furniture in your new floor plan. • Give notice to your current apartment.